There have been times when I have wanted to make booklets of a few pages, and it is generally a fiddly job. You can see my efforts to make an A5 (half A4 size) here. This week I needed to make a four page A6 (quarter of A4 size) booklet, and wanted it to be a simple folded job, ie, print single sided with the four pages reduced to fit on a single sheet, 2x2, then fold it into A5, then again into A6. It wasn't so hard after all, and for you USA people who use Legal and Letter size paper, the same idea will work fine. Create your document in your favourite word-processor (mine is Open Office / Libre Office). You will need to use a large font so that the type is readable when reduced to quarter size. Export it as a PDF file. 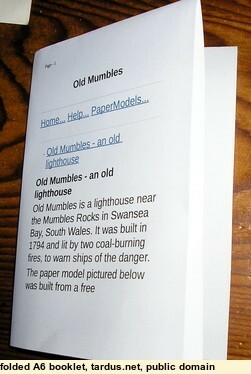 Here is my sample, oldMumbles.pdf. The result is another PDF with 4 pages, page 1 upside down, then page 4 ditto, then page 2 and lastly page 3. 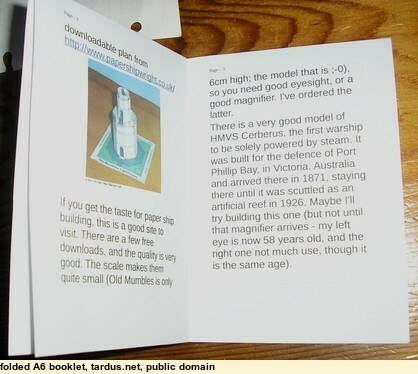 You can see it here, oldMumblesA6booklet.pdf. 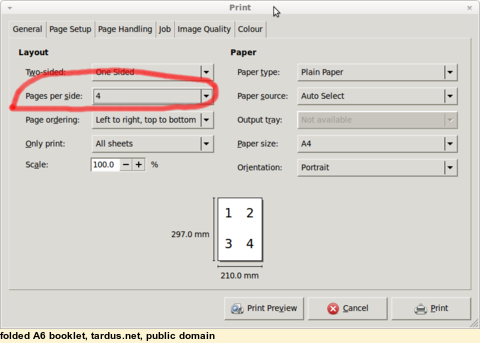 If you do not want to use Evince, and your PDF viewer does not do 4-up printing, you can use the standard psutils (Postscript utilities) to achieve the same end. You can then print the 4up Postscript file (Hopefully you have a document viewer that can handle Postscript files).